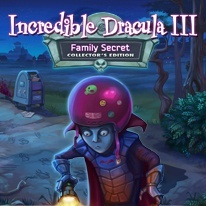 Save Dracula from the unspeakable horror of pesky relatives in this thrilling new adventure! When a gaggle of Dracula's distant kinfolk shows up at his castle expecting a warm welcome from their cold-blooded host, he begrudgingly accommodates them. But when they won't leave, his patience wears thin. To send them on their way and reclaim his former title as Lord of the Castle, he'll have to capture the creature that demolished his family's estates and return their homes to pristine condition. Join Dracula and his zombified servant Rufus as they travel far and wide to track the beast and repair the damage it has done. To complete each quest and earn the best rewards, you'll have to manage your time and resources well.